The Seaplane Harbour Maritime Museum (Estonian: Lennusadam) is the most exciting European museum in Estonia, located in the Kalamaja district of Tallinn. Adults and children will be thrilled with the museum’s exhibit items and will definitely have a great time together. The Seaplane Harbour Maritime Museum building was originally constructed as a part of Peter the Great’s naval fortress. The Seaplane Harbour hall has an area of 8,000 m². The hall finished operating during the Soviet era and its’ renovation started only in 2010. Finally, the museum was opened in spring 2012. This amazing museum presents us about two hundred large exhibits. Each attraction there is placed in three levels: below the sea, on the sea, and in the air. You will learn the history of the old maritime Estonia in an accessible modern language. The harbor will tell you many fascinating stories and will let you experience many interesting things! In the museum you can find a submarine, flight and shooting simulators, and also a pool, where you can sail miniature ships. The main and the most popular attraction in the museum is submarine Lembit. It was ordered by Estonia from the United Kingdom. The submarine dates back to 1930’s and nowadays has been renovated to its original appearance of those times. Lembit is the only surviving mine-laying submarine in the whole world. You can also see the dignified icebreaker Suur Tõll standing by the pier. In 2014 it celebrated its 100th birthday. Its original name was Wäinämöinen and it used to sail for Finland. It was conquered from the Russians near Helsinki in 1918. The ship has been restored to its original appearance both on the inside and the outside. During the summer months you even can try dishes from a 100-year-old menu of this ship’s crew. By visiting the Estonian Maritime Museum at the Seaplane Harbour, you will feel yourself like a real sailor. 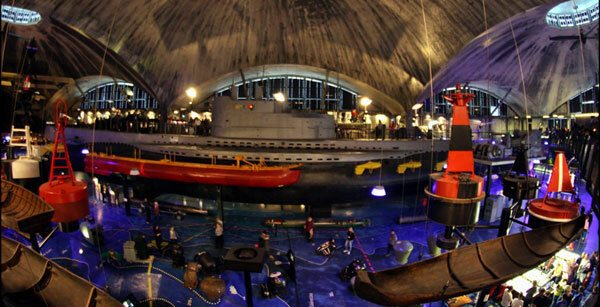 Test yourself by playing different simulators at the museum; explore the yellow submarine with your friends and family members and learn more about the life of the sailors who once operated it; walk through the aquarium; walk along the harbor; explore the many more exciting things to see and activities to do. At the end of the day, you can get a wonderful view overlooking the Port of Tallinn from the Seaplane Harbour. After your long and interesting maritime journey you should definitely relax and end your day on the outdoor terrace of Café Maru or in the nautical-themed museum shop.